The Strait – or “the Gulf”, as mariners have traditionally called it – is not a body of water to take lightly. It’s about 135 miles long and at its widest, close to 20 miles across, and its alignment matches the prevailing winds, which blow from the southeast in winter and northwest in summer. That means there’s a very long fetch for those winds to build up and plenty of open space for steep waves to develop. If you have to “cross the Gulf”, you need to keep a close weather eye and choose your timing wisely. Nevertheless, there are many lovely days throughout the year when it’s calm enough to get out on the water and enjoy little gems like this nameless islet. We’ve paddled our kayaks there and back many times over the years, in all seasons, and when I look through those leaning trees I always enjoy the view of the Strait and the BC mainland. This image is one the 34 mounted prints of the west coast that I have on display right now at the Silva Bay Restaurant & Pub on Gabriola Island. Called “Inspired by the Coast”, the show will continue through September, so if you’re in the area I hope you’ll drop by to have a look – and you can also enjoy a great meal while you’re there. Between my show, the demands of planting and tending our food garden, work projects and various other commitments, I’ve not had time lately for blogging. But I have been posting some photos to my Flickr page, so if you haven’t been there lately I hope you can take time for a visit. 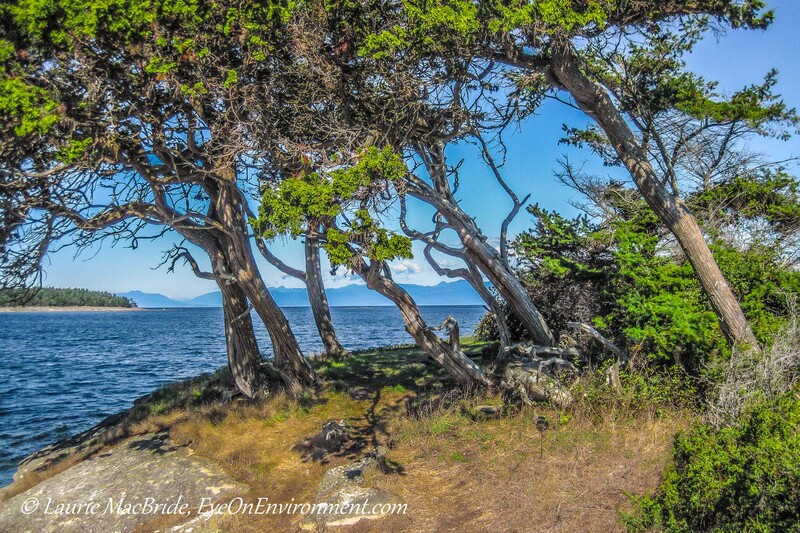 Posted by Laurie MacBride, Eye on Environment on June 20, 2014 in BC coast, Gulf Islands and tagged Gabriola, Georgia Strait, islands, nature, ocean, photos, places, shoreline, Strait of Georgia, trees, weather. Very nice image Laurie! Love all the detail in the trees. LOVE this shot, Laurie, it’s truly a quintessential coast outlook!! Thanks Toad! We paddle to this little island quite frequently and I do continue to love the view from there. We try to go across only when it’s calm! Though it does take three or four hours to cross, so the seas can build. Thanks for the comment & glad you like the image, Sherry!